** Original members of the Lt Joseph Gordon Crew. Flew all of their missions with Lt Gordon and then with Lt Cunningham as Pilot. Lt Joseph Gordon flew three missions as Pilot. Reassigned as CoPilot and flew his remaining missions with several different Pilots. 2Lt Neil E. Cunningham (P) - Flew his first mission (8 Jan 45) as CoPilot with the Joseph Gordon Crew and then as Copilot with 4 other Pilots on his next 14 missions. 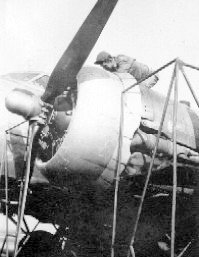 Upgraded to Pilot on 12 March 1945 after which 19 missions were flown as Pilot. Unknown Groundcrewman working on Cunningham Crew's favorite B-17. Crew Waist Gunner, Sgt Kenneth E. Boone (WG)** (Not in photo) - Flew 2 missions with Lt Joseph Gordon as Pilot and Lt Neil Cunningham as CoPilot (13 missions) and Pilot (10 missions). Deleted from the Cunningham crew following the 31 March 1945 mission when the crew size was reduced from 9 to 8 men by eliminating the Waist Gunner crew position. 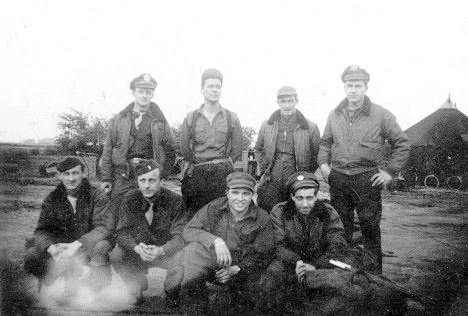 08 January 1945 - Mission #299 to Schweich, Germany in B-17G #42-102945 Sweet Pea (358BS) VK-P Lt Joseph Gordon Pilot [see Gordon Crew Photo text]. Sgt William Carter (BT) credits Lt Cunningham with saving the lives of the entire crew on the 08 January 1945 mission when he took over the controls of their badly damaged B-17 and made a successful wheels up landing in a plowed field near Tournet, France.